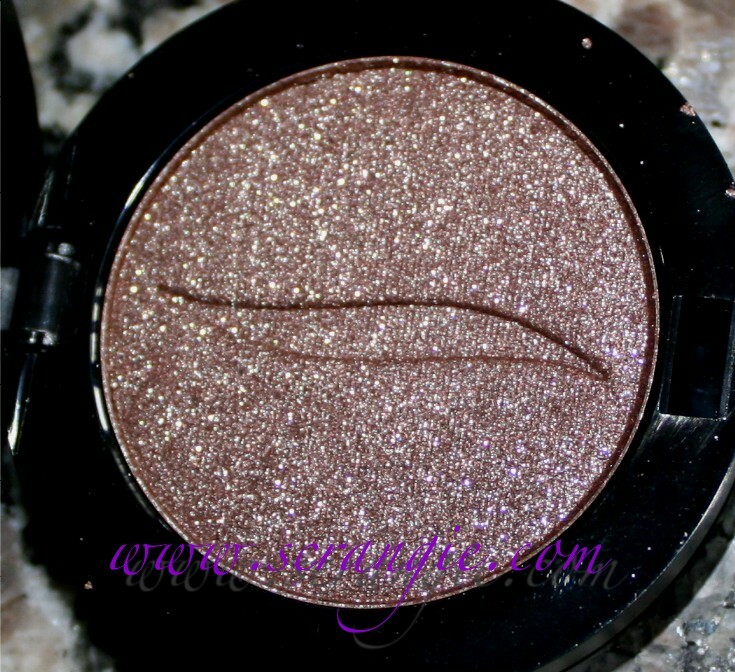 This is the full size Sephora Collection Mono eyeshadow in Choco Excess 19. It's a warm brown with lots of flaky glitter and gold microglitter. I haven't used this yet. 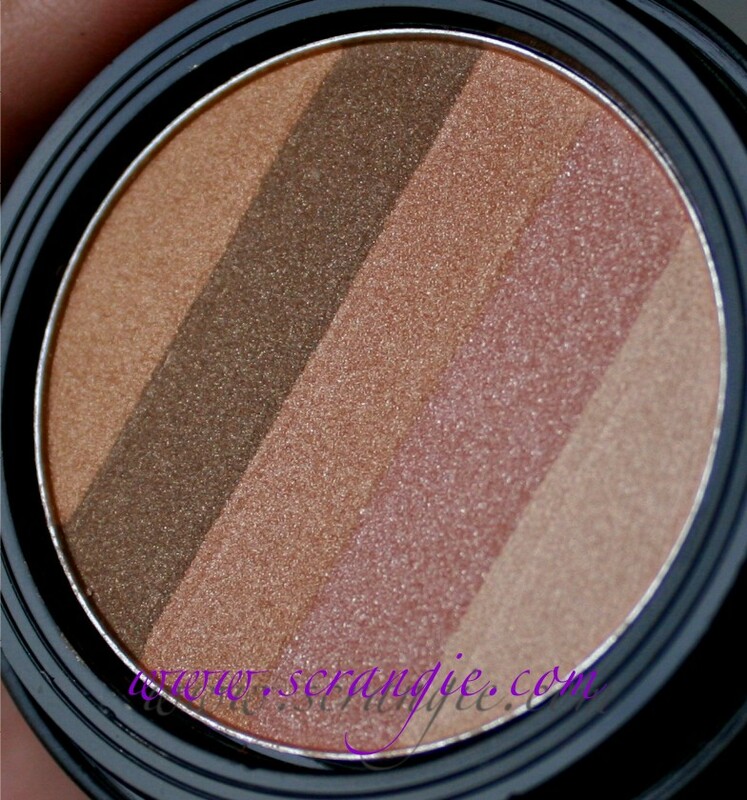 Smashbox mini Fusion Soft Lights in Dusk. I tend to collect these. 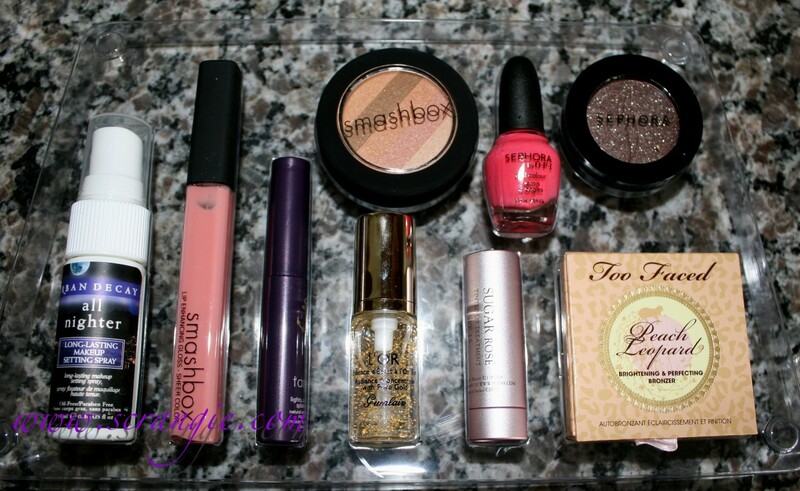 They're probably my favorite thing from Smashbox... well, that and the primer... And the brushes. 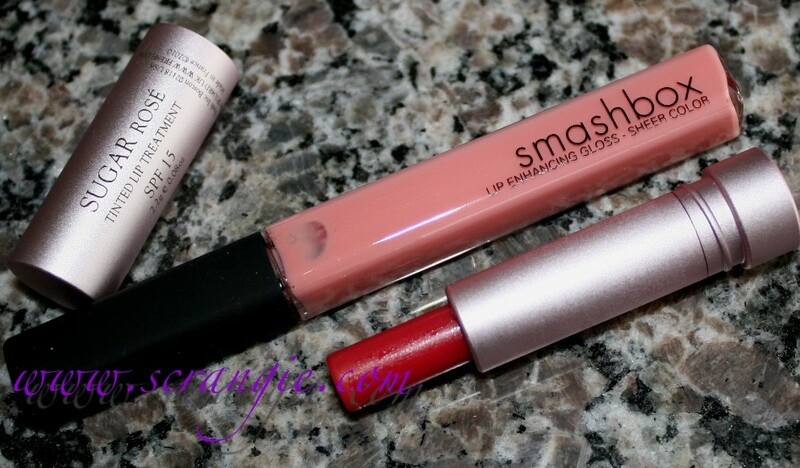 Full size Smashbox gloss in Pop and mini size Fresh Sugar Rosé tinted lip treatment. 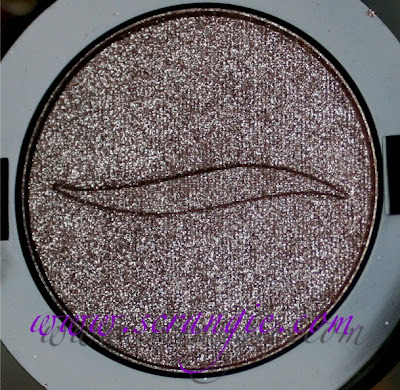 - 0.07 oz full-size Sephora Collection Mono Eyeshadow in Choco Excess 19 (dark chocolate with silver glitter): Haven't tried to use this yet, but it sure is pretty to look at. I think they just included this inexpensive house brand shadow to be able to say the kit comes with two full-sized products. - 0.13 oz Smashbox Fusion Soft Lights in Dusk: I used this as a bronzer/blush and it's great. It's bronze but not too warm or ruddy, and the small amount of shimmer in it makes it look smooth and blurry, not sparkly and bumpy. 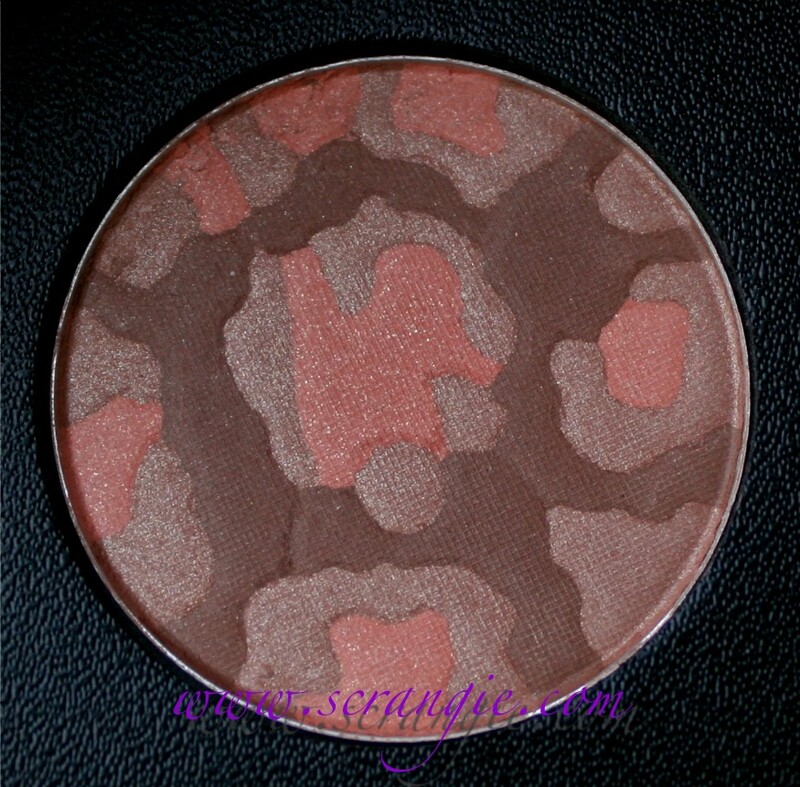 - 0.08 oz Too Faced Mini Peach Leopard Brightening & Perfecting Bronzer: Looks gorgeous in the pan, but I'm beginning to think that the Too Faced bronzer minis are a lower quality than the full sizes. This was hard and not very pigmented, nothing like the formula of all my full-size Too Faced bronzers. It's cute, though. - 0.125 oz Sephora by OPI nail colour in I'm Wired (opaque electric coral red): Haven't worn it yet but the tiny bottle is cute. This is not normally the type of color I wear- too safe and normal, not fun enough... But I could be wrong, it could be really fun and bright when it's on the nails. - 0.08 oz Fresh Sugar Rosé Tinted Lip Treatment (sheer berry rose in pink case): Same formula and feel as the original Fresh Sugar Lip Treatment (melty, buttery, a little grainy, lemon scented), but this adds a red berry tint to my lips. Very sheer, subtle, doesn't stain. The sample is not secure in the tube- feels like it's going to break off whenever you use it. The packaging is really nice for a sample- it's a metal screw-cap tube like the full size. - 0.18 oz Guerlain L'Or Radiance Concentrate with Pure Gold Make-Up Base: I'm not even sure what this is supposed to do, but I had to have it. The best part of it is the gold suspended in the fluid. It's so cool to look at. Unfortunately, it does nothing. It stings and then makes my skin look oily. The gold doesn't add shimmer, it just dissolves and disappears. Can't figure this one out and I'd never pay $70+ for the full size (ONE OUNCE!) bottle. 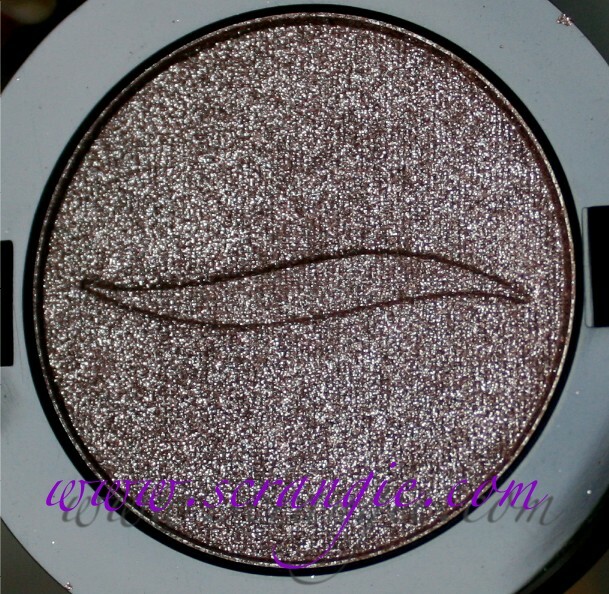 - 0.10 oz Tarte Lights, Camera, Splashes! Mascara in Black: This seemed old... It was too dried out to use. What a waste. I like the original formula Lights, Camera, Lashes though. - 0.34 oz Urban Decay All Nighter Long-Lasting Make-Up Setting Spray: I've used this before and liked it, but I do have a complaint with the sample packaging. The sprayer on the mini sizes doesn't mist; it splatters. Instead of a fine, even application you get splotches and puddles, which still work, but it's uneven. I've used this for keeping glitter on my eyes but I haven't used it for setting my makeup. - 0.20 oz full-size Smashbox Lip Enhancing Gloss in Pop (cool pink): Really pretty color- sheer milky slightly warm pink. Very flattering. Smashbox gloss has a nice formula that's smooth and non-drying, not sticky at all. This set costs $39. Is it worth $39? My opinion: no. Why? These are all samples. Sure, they may be deluxe samples, but they're still samples. Tiny. I know samples aren't free to manufacture or distribute, but I don't see how this set is a "$135 value". Did I buy it anyway? Yeah, because I wanted to try some of these things without committing to a full size. What I should have probably done is just buy the $28 full sized Peach Leopard bronzer and not this. I think this kit would be more fairly priced at around $25 and I wouldn't hesitate to purchase it again at that price. The full sized products included don't really increase the value of the set; the gloss is one of those things that Smashbox is constantly giving away as Gift With Purchase or during Let's Do Lunch, and the house brand shadow isn't exactly a selling point, you know? I'm making it sound like I don't like this set, aren't I? That's not the case. I do like this set, that's why I bought it. 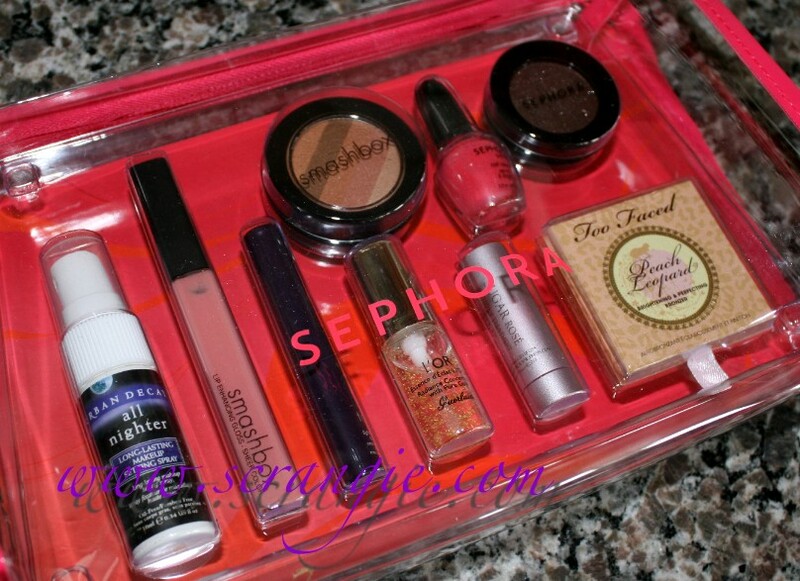 I just think that $40 is too much for a bag of samples and two cheapie/giveaway full sized items. Lower the price and I'd have nothing to criticize. I do think it's a great set and I like (almost) everything that's in it. It is cheaper than buying all of the items in full size, after all. But I still really want that Peach Leopard bronzer in full size. Arg. This looks amazing- sooo annoying that we don't have Sephora in the UK! The gold in the Guerlain l 'or is supposed to prevent inflammations. Even though you say it doesn't do a thing for you I already used up two full sized bottles. It makes my skin calm en provides a superb base for the rest of my make up. Unfortunately it doesn't help to extend the wear of your make up so you should use something like a true make up primer over it, or maybe fix+ or a powder to set. Hope this helps! I have been burned too many times on these multi company sample boxes. Like you said, the product ends up dried up, not same quality, almost like Sephora got hooked up with knock off companies that created fakes for them. I can tell even looking at your photo of the Two Faced Peach, it is not got the same consistency as the reg. size one. I could have found something I would much rather spend $40 on at Sephora than this. That gold stuff is all the rage btw. The properties of gold are supposed to be just that, gold to the complexion. All the ones in an oil/serum suspension I have sampled have all been an oil that did not drink up into my skin. must. get. this. now. so in love!! I have the same problem with the nozzle on my full-size De-Slick Setting Spray from UD. I've been spraying it onto a sponge or fluffy brush to apply it to my face evenly- maybe you could try that?